Mazda is giving its CX-5 crossover a slew of updates in Japan, two years after the second-generation model made its debut in the Land of the Rising Sun. Although there aren’t many visual changes, there’s quite a bit more to be found under the skin – especially under the bonnet. That’s because the car is finally being offered with the turbocharged version of the 2.5 litre SkyActiv-G four-cylinder petrol engine. With this, the CX-5 becomes the first model in Japan to be offered with this mill, which produces 230 PS at 4,250 rpm and 420 Nm of torque at 2,000 rpm, and delivers a fuel economy figure of up to 12.6 km per litre on the new Worldwide Harmonised Light Vehicle Test Procedure (WLTP). As with all models, this engine is paired to a six-speed automatic transmission and a choice of either front- or all-wheel drive. Somewhat curiously, Mazda has also added a six-speed manual option to models fitted with the 172 PS/420 Nm 2.2 SkyActiv-D turbodiesel, making it the only SUV in its segment that allows you to row your own gears, Hiroshima says. Elsewhere, the G-Vectoring Control (GVC) system has been enhanced and now applies light braking force to the outside wheels coming out of a corner, providing extra stability as the driver straightens the steering wheel. This smoothens transitions between roll, yaw and pitch even with high cornering forces, enabling the car to better respond to sudden steering inputs and exit corners more crisply. As such, the new GVC Plus system is claimed to improve handling in collision avoidance manoeuvres and providing a “reassuring feeling of control” when changing lanes and when driving on snow or other slippery surfaces. 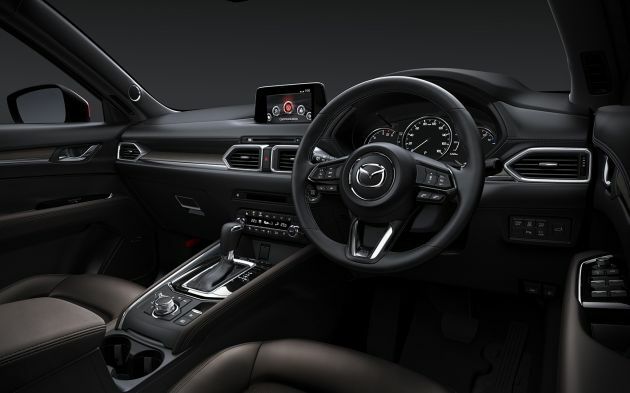 It comes as standard on all CX-5s and will be rolled out to other Mazda models. Other changes are more minor and include a new nighttime pedestrian detection function for the Advanced Smart City Braking Support (SCBS) system, a 360-degree camera option, Apple CarPlay and Android Auto compatibility and new tweeters for the standard sound system to bring the total number of speakers up to six. There’s also a new Grey Metallic finish for the base 17-inch alloy wheel and redesigned climate controls. Last but not least is a Exclusive Mode special edition model, available with the turbo petrol and diesel engines. This top-of-the-range variant adds 19-inch alloys in a new dark gloss finish, Deep Red Nappa leather upholstery, real woodgrain interior trim, a frameless rear-view mirror, ventilated front seats, a seven-inch TFT LCD instrument display and white LED lighting throughout the cabin for a more consistent look. With that kind of output figures it should be a 2.0 rather than a 2.5l engine. I won’t comment on Honda’s 1.5T engine because that engine has some issues and is being recalled in Europe. Do u think u r better than Mazda engineers? Plz come to Msia babe! Yeah, bring in 6 speed manual for 2.2 turbodiesel too. (Like) Mazda CX-5 2.5L turbo. CX5 2.0T more suit MY drivers. How fast? How can anyone know when there isn’t any records of testing that I can find on the web. I wold like to know just how fast it is. I curious why mazda not building 2.0L turbo, lower cost and lighter to improve handling, also it should be higher demand globally. The price tag will be the major factor now. If it is about RM200k, I do not think it can sell well here. Afterall, how many of us drive CX-5 like a hot hatch? Some will definitely say better power if go up Genting. Hey, do you pay that much just for go up Genting long in a while? Crap la. I just booked the top spec model last month. LOL. Alamak if Bermaz sells this 2.5 turbo in Malaysia, the CR-V turbo will be smoked for sure lar. Resale value by Sam Loo is another issue. LOL! The current model is a very nice car but does lack a fair bit of pep from the 2.0 and 2.5ltr engines. This will certainly sort out that issue for the 2.5ltr model, particularly with greater torque. I would have thought adding a turbo to the 2.0ltr would be wanted too, perhaps a Mazda marketing strategy to only add it to the higher priced model. As for pricing, I think Mazda will have to be careful and also realistic. With the upcoming release of the X70, I am envisaging a fair bit of price movement in SUV’s in the not too distant future. Honda, Mazda and Nissan will have to remain nimble on their feet if they don’t want to lose too much of their current market share, particularly Honda. If the release of the X70 suite of models is a success and pricing is realistic, then other manufacturers will have no choice but to lift their game when it comes to extra features,service and value.The perceived quality of the X70 seems good, actually very good. The clincher will be pricing and reliability. The stripped down features of the locally assembled Honda’s, Mazda’s, etc.may become a thing of the past because of all the features the X70 offers. Fingers tightly crossed on that, as it’s one of my biggest annoyances, having to buy a car at a higher price than overseas buyers and to also be given less features than standard overseas cars. Interesting times ahead for Malaysia in the SUV space. 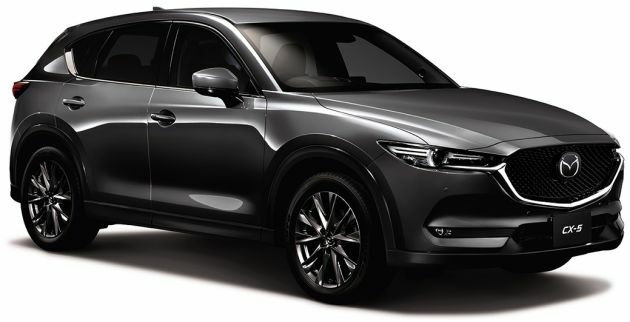 Is the 2.5 litre Turbo CX5 actual coming to Malaysia? Can anybody confirm this please. Or is it only for limited country like Japan! I’ve seen nothing mentioned yet about a turbo in the 2.5l for the Malaysian market My gut feeling is that it will come, but WHEN is the question. Android Auto and Apple Car Play appear to be on their way too. Power boot is already being implemented, so ideally they could/ should put all the new features into the 2.5l model early 2019. As I mentioned in my previous post, depending on the success (or failure) of the X70, we should see the likes of Mazda and Honda getting their act together and ensuring our local market get all the features we deserve.You can’t beat competition to focus the mind of the manufacturers, so obviously I hope the X70 s a success and gets rival companies to join the market share battle.Otherwise companies like Honda in particular may see their sales figures being hit hard. It should be an interesting time in the SUV space from November and I’ll be very keen to see how the game pans out. If cx5 turbo does come into malaysia , it will be priced above 200k to fight with toyota harrier.